Brian was 7 months in this picture and Corbin had just turned two. Brian was just getting to the age where he could get around pretty fast, had his own personality, and was becoming the perfect play partner for Corbin. 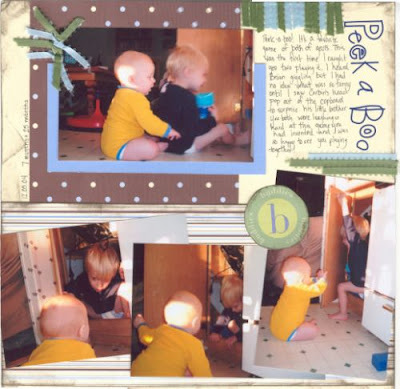 When I made this scrapbook page I remember being so excited they were playing together and thinking of all the possibilities they would have together in their future. What best friends they would be, their private jokes, their pretend worlds they would make together. Little did I know that years down the road, no matter how much Corbin persuaded his little brother, there wasn’t going to be much of this give-and-take play they had at such a young age. Right now I’m listening to the boys in the fort we built a little while ago- Corbin saying, “C’mon Brian- just play!” and Brian whining, playing with his cars back & forth in the entrance of the fort.